Berlin, 1945. Somewhere on the streets of Dahlem, a dashing US officer accosts a long-legged 19-year-old, demurely asking for directions to a place he has traveled a dozens times before. They are swept off their feet. One out of an ill-fated, fading marriage, the other from the rubble of war and desolation. They moved to Maryland. So goes our family mythology. My grandmother always told us the same handful of war stories. Stories for small children, about young children in the war. She told of the day the war broke out while she was at summer camp, how she spent all her pocket money to buy her favorite hazelnut-studded chocolate (it is something little German girls knew in 1939 — that in times of war, chocolate becomes scarce), only to discover, too late, that the nuts were full of worms. She told how her parents had once asked her to watch over the cooking of a duck, a unique feast bartered by my great-grand father against school lessons. How else to know when it was done, other than to try it, just a little piece? Starving, she ate the entire thing. She told of her encounter with the Russian soldier reeking of alcohol who tried to steal her bicycle — unexpectedly pelted by a spew of Russian swear words from the long-legged German girl, he lost countenance just long enough for my grandmother to speed away, back the way she had come. She told us how she met our grandfather on a street corner in Dahlem. When she married my grandfather, my grandmother became fiercely American; though they soon moved back to Europe she fully embraced an American expat life. But she also remained proudly German, and nurtured German traditions, especially around Christmas. We laid out milk and cookies for St Nikolaus on December 6th, we baked, we opened presents on Christmas eve, we lit our tree with candles. So today, amid the wreaths and advent calendars, among the candles and the singing, the oysters and the cookies, there are two traditions that I hold dearest. They connect me to my grandmother, and in one grand sweep I like to think they link me not only to our family story but to Europe’s history too. 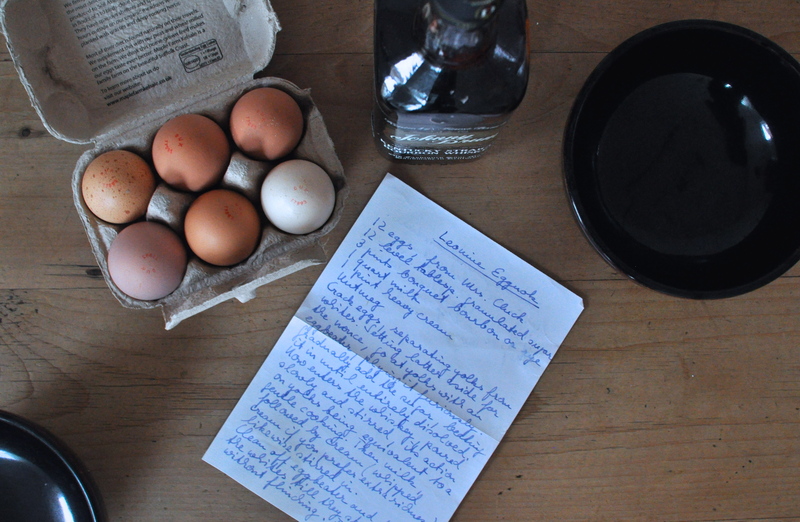 The two recipes that my grandmother sent me, once upon a time, handwritten, slipped inside the letters she wrote regularly: Stollen and eggnog. Sweet Stollen, a long, patient, and tedious process, which ultimately brings the reward of nibbled bites that taste of the promise of sheltered German childhoods. 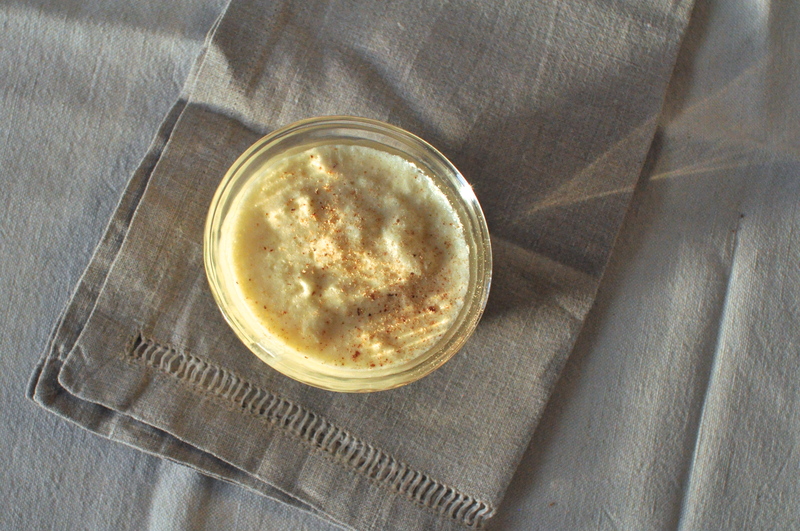 Boozy eggnogg, the stuff of joyful parties, the mirth-filled evenings of a war-less era. My grandmother was an elegant, modern, impeccable hostess. Though she was a very good cook, she much preferred to delegate kitchen duties and sit on the sidelines with a glass of champagne and a cigarette. She loved company, and she loved parties. Every 26th of December, my grandparents hosted an eggnog party, to celebrate their anniversary. This is their recipe. In loving memory. Crack eggs, separating yolks from whites. Setting latter aside for the nonce, go at yolks with an eggbeater, plying in furiously. Gradually add the sugar, beating it until entirely dissolved. Now enters the whiskey, poured slowly and stirred, its action on yolks being equivalent to a gentle cooking. 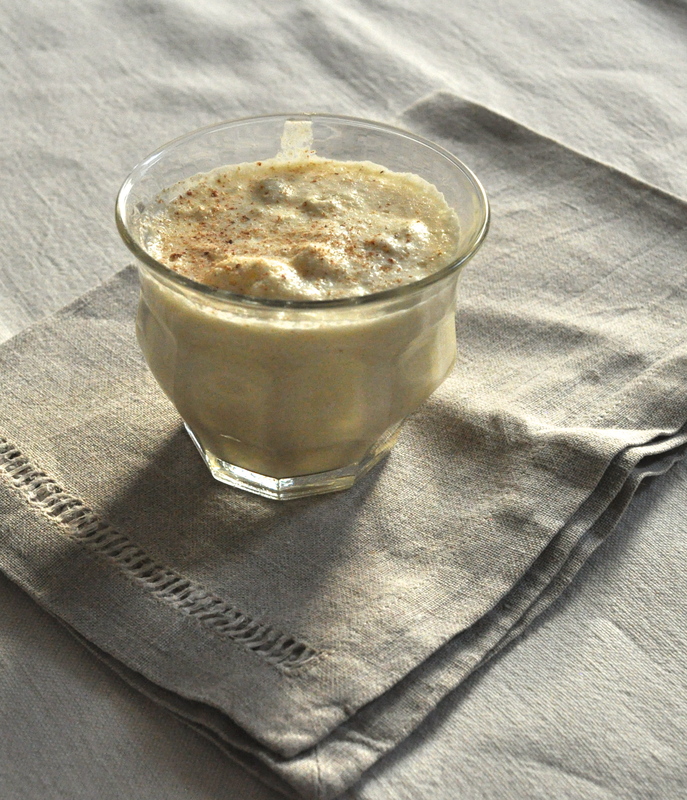 Then milk, followed by cream (whipped cream if you prefer extra richness), likewise stirred in. Clean off eggbeater and tackle the whites till they stand without flinching. Fold them into the general mixture. Stir in one grated nutmeg. Will serve 12 people (or more). If it’s the whipped cream version, they’ll need spoons. Separate the egg yolks from the whites, which are set aside for later. In a medium bowl, beat the yolks thoroughly, gradually adding the sugar while continuing to beat firmly. Then slowly pour in the whiskey, still stirring more gently but constantly. Now add the milk, then the cream. In a separate bowl, beat the egg whites until very firm (until the peaks hold without moving). Gently fold the whipped whites into the rest of the egg/whiskey/cream mixture. Garnish generously with freshly grated nutmeg. 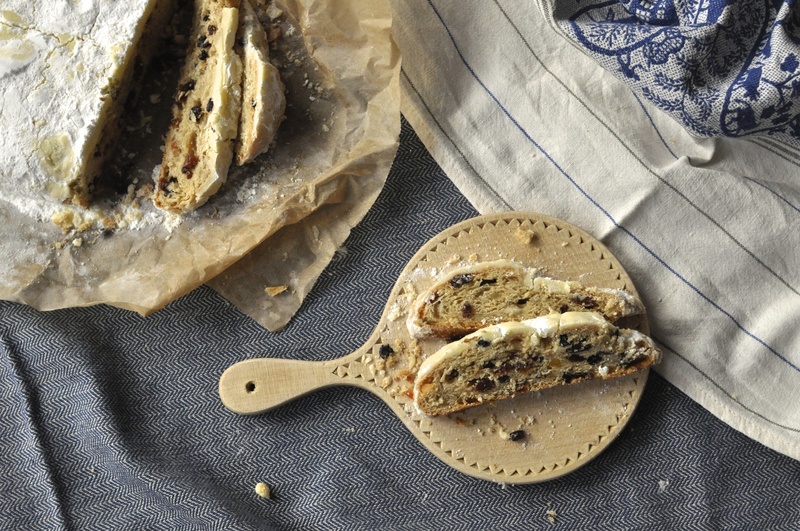 It’s Christmas Eve and finally time to cut the Stollen! Read my story on Food&_ about this favorite German Christmas tradition and the proper way of savoring it (then bookmark the recipe for next year!). A very merry Christmas and happy holidays everyone! Maybe I wasn’t being completely truthful last year when I exclaimed that the almond and currant cookies of my youth are my favorite. In reality I’ve always loved Zimtsterne most of all. As a little girl, cinnamon stars represented the very promise of Christmas. The sweet tinge of icing an irresistible finish to the chewy bite. Nutty. Not too cinnamony. For some years I may have snubbed them a little, perhaps in a flaccid effort at emancipation from too obvious a childhood treat. But why resist the irresistible? This is another recipe my mother has kept alive all these years. She received it initially, many years ago, from Marcelle, a close family friend and my grandparent’s neighbor in Switzerland. Store in an airtight tin box, separating the layers with parchment paper. Pulse chop the almonds in a food processor until they reach the consistency of coarse sugar. Transfer to a large mixing bowl. In another bowl, beat the egg whites with a pinch of salt until very firm. Add the sugar, cinnamon, and 1 tablespoon kirsch to the almonds. Fold in the egg whites with a wooden spoon, then knead by hand until the dough holds together (kneading will help extract the almond oil). Take the dough and flatten it evenly on a slightly moistened wooden board (working in batches if necessary). The height should be approximately 8 mm (1/3 inch), but the most important is that it be even so it also cooks evenly. Let the stars rest, uncovered (they must dry a little), at room temperature, for a few hours or overnight. When ready to bake, preheat the oven to 350°F (180°C). Slide the sheet in the middle of the oven and bake the cookies for 10 minutes. They will harden when they cool but must remain moist. Make the icing by mixing the icing sugar with 1 tablespoon Kirsch and 1 tablespoon water. The icing should be quite liquid, add water drop by drop if necessary. Using the back of a small spoon, coat each star, while still warm, with a light layer of icing. Let dry. Store in a tin box, layers separated by parchment paper, for up to a month. The truth of the matter is, rather than preparing for a blasphemously belated Thanksgiving on Saturday, for which most of my family is crossing the channel, I have been roasting quinces and simmering chutney. Last week, friends unexpectedly brought me a big bag of quinces from their garden in the Cotswolds (I hear it is more of an orchard). I was quite excited and may possibly have briefly jumped up and down at the sight. It was a very busy week, and I was away this weekend — the quinces were becoming impatient. Quinces do hold out for a while but I wasn’t willing to tempt fate for too long, so last night I made chutney. As a first test improvised from a few recipes it is quite good, but I am not entirely happy enough to report the results here — yet. In any event, Thomas managed to save the last of the quinces from their chutney fate, begging that I make quince paste, too. 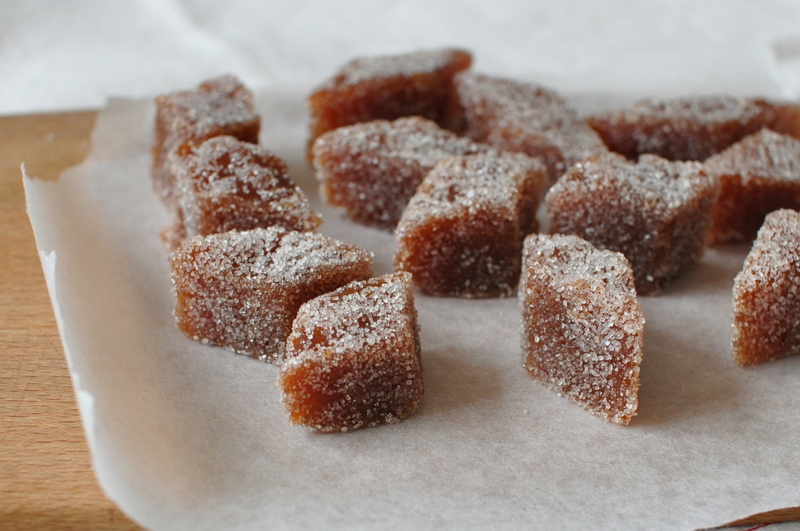 What he doesn’t know is that in the course of the morning, half of the membrillo has been transmogrified into my absolute favorite sweet: pâtes de fruit. The preparation is the same up to the point of cutting the paste into dice or rectangles and coating them with sugar. Rub the fuzz from the quinces and wash well under cold water. Cut the quinces in half and place them face down in an ovenproof dish. Cover with aluminum foil and bake until the quinces feel quite soft when poked with a knife (probably 1 1/2 to 2 hours). While the quinces are still warm, pass them through the fine mesh of a vegetable mill. (To insure a very pure paste, first remove the quinces’ core). Weigh the purée, place in a saucepan, and add an equal amount of sugar and one tablespoons of lemon juice per 100g of quince. Once the paste has reached a dark, heavy consistency, spread on a plate to cool. 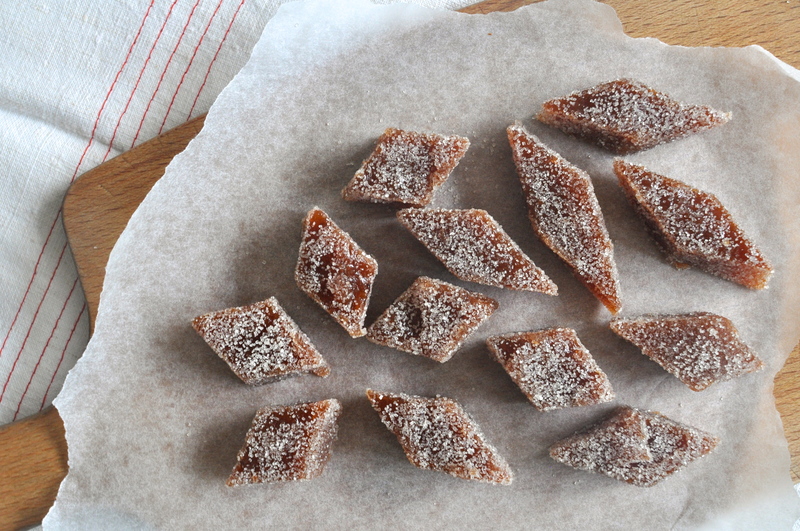 Once cool, cut into the desired shapes and roll in some sugar. The pastes should keep for a few weeks in an airtight container in the refrigerator. Traditionally, my mother and I divided baking duties for Christmas. I baked Stollen, she made everything else. 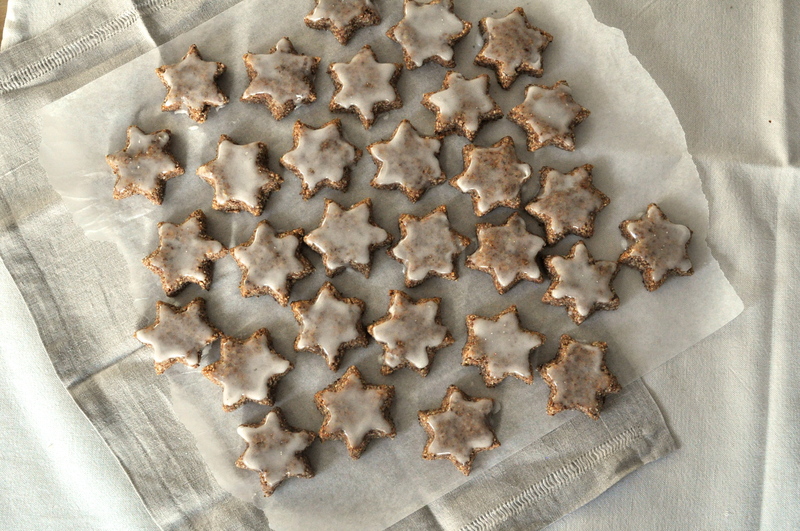 A most delicious fruitcake that soaks in bourbon for weeks, gingerbread with the children, Zimtsterne (cinnamon stars), Haselnuss Leckerli (Swiss hazelnut cookies), and these almond and currant cookies. Recipes from our childhood, which she has baked for decades. In a newly discovered enthusiasm for baking cookies, in the past couple of years I’ve sought out new recipes, to complement the Christmas spread. Last year I also decided to make these myself, to pick up the tradition, perhaps? They are understated, without the heady Christmas spices. They are my favorite. The dough must sit in the refrigerator overnight so plan accordingly, otherwise the cookies are extremely quick and easy to make. They improve with time so, ideally, they should be prepared a few weeks in advance. Oh well. Mix the butter and sugar until light and fluffy. Add the egg yolks and mix well, then the flour. Mix and knead until the dough is homogenous and smooth. Divide the dough into two equal parts. Add the almonds to one half and the currants to the other, kneading well until they are completely integrated. Roll each half into a long log approximately 2 in (5 cm) in diameter. 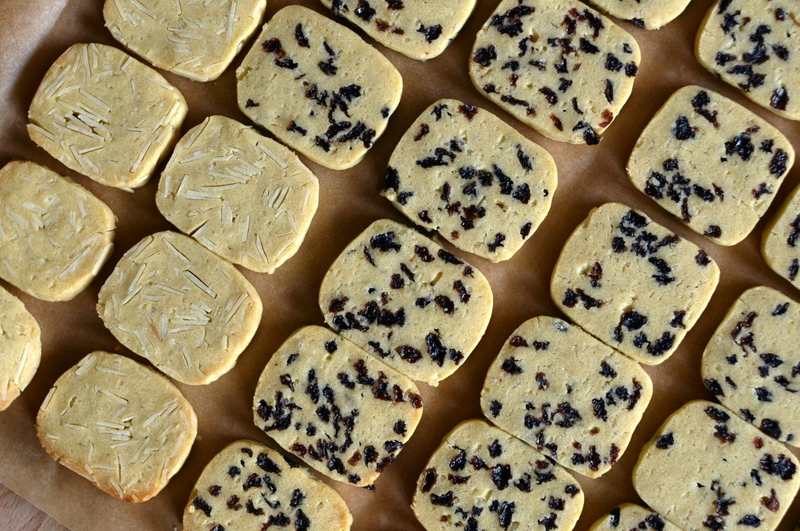 (Optionally, to make squarish cookies as shown above, flatten the log on four sides.) Wrap each log first in parchment paper then clingfilm, and place in the refrigerator overnight. When ready to bake the next day, preheat the oven to 400°F (200°C). Store in a tin in a cool dry place for up to a few weeks.